Saucony Kinvara 8 are neutral cushioned running shoes. The Saucony Kinvara 8 features few improvements to keep the position as the reference for natural running although much more complex than original one which disrupted the market some years ago. Slightly heavier and in top price segment new Freedom ISO includes a more integrated ISOFIT™ system and can be located in premium segment within natural running shoes. Anyway Kinvara 8 remains true to responsive ride (4 mm drop), lightweight and abundant cushioning principles from the popular saga. Upper is simpler compared to its predecessor Kinvara 7 with a more open engineered mesh (including laser cut holes) for enhanced ventilation. Pro-lock™ system embracing midfoot has been redesigned for more comfortable pressure distribution and snug fit. As usual, interior lining from both ankle collar and tongue are made of RUNDRY™ fabric for great breathability and odour control resulting in optimal sanitation. 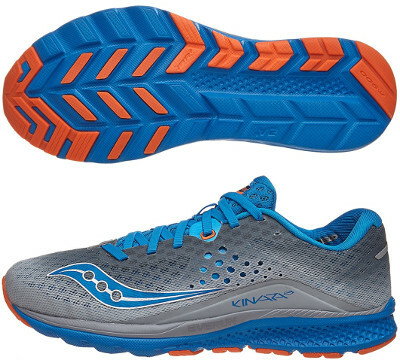 Midsole in Kinvara 8 follows trend seen in other Saucony running shoes like premium Triumph ISO 3 of full-length EVERUN topsole (and not only heel pad) above SSL EVA foam for more responsive ride. Outsole keeps TRI-FLEX design in the forefoot due to great performance while materials don't change either with softer rubber (IBR+) in the forefoot to enhance cushioning and harder carbon one (XT-900) in more exposed areas for longer durability and better grip.